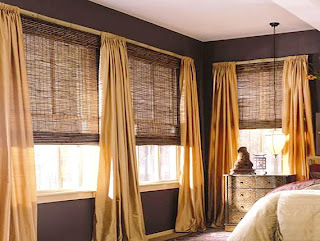 Nothing can transform a room as quickly and effectively as a well thought out, beautifully designed window treatment. Window treatments don`t just dress up a window; they`ll also tone in with the shades and textures of your furniture and flooring. Whether you`re trying to create a look that`s casual or formal, whimsical or elegant, innovative or traditional, the right window treatment will go a long way toward creating the distinctive look and ambiance you`re aiming for. If you`d like to update your living spaces, then adding new blinds, curtains or window shades can help you to modernize the most outdated room. Here are a few of today`s most fashionable decorator trends in window treatments. If you`ve been looking at model showcase homes recently, you`ve probably noticed that at least one room will have wood grain blinds covering the windows. Today, wood grain blinds are more popular than ever and can be found in a variety of woods. In past years, bamboo was especially popular, not only because it`s a relatively inexpensive and sustainable wood, but also because of its lightweight texture. Within the last several years, however, decorators have started to favor wood grains such as birch, maple, cherry and mahogany. Decorators are also enthusiastic about some of the newer wood grain blinds with woven accents reminiscent of grass or bamboo reeds. These look especially decorative in a casual, airy room with lightweight wood and wicker furnishings. Vertical blinds continue to be popular with homeowners and decorators alike. Seen from a distance, vertical blinds give a first impression of sharply pleated curtains and for many homeowners they offer far more visual appeal than traditional horizontal blinds. Vertical blinds are available in both wood grains and fabrics and are made to fit just about any shape or size of window. If you think that velvets and brocades are only suitable for the inhabitants of Downton Abbey, then think again. Today`s decorators are waxing enthusiastic over the most luxurious silks, crushed velvets and damasks, even for the smallest of areas. Luxury window fabrics can dress up the plainest room and make it sparkle with rich jewel tones. Just add a few gold fringed tassels and your room will be fit for royalty. If you prefer, you can also opt for a more contemporary feel by choosing luxury window treatments made of faux fur, suede or leather. Pencil pleat curtains are back in style and more popular than ever. With their thin, soft precision pleats, they add texture and a touch of traditional elegance to any window. You may associate pencil pleat curtains with your grandmother`s house, but today`s pencil pleat styles are made in modern, no-wrinkle fabrics and colors. Best of all, they require very little maintenance, so you don`t have to worry about ironing those tiny pleats all day the way that your ancestors did. If you`re thinking about buying shades, it`s time to go for the bold choices. Shades are hot right now, especially in big floral, striped and geometric prints that are reminiscent of the 1950s and 1960s. Relatively inexpensive compared to other window treatments, brightly patterned shades can bring a welcome deluge of color that will liven up even the most boring, monochromatic room. Whether you`re looking at pencil pleat curtains or other fashionable designs, make sure that you choose something that you like and will enjoy living with. In the end, the most modern trends may not appeal to you and you may prefer something more traditional. The good news is that with the wide variety of materials, styles and colors available, you`re sure to find whatever you`re looking for, whether it`s a traditional, softly billowing pencil pleat curtain or a heavy, luxurious royal purple brocade complete with gold tassels. Once you have designed your new or remodeled kitchen, it`s time to make some crucial decisions on choices that will impact your kitchen`s look, design layout and overall functionality. The right cooker is essential to your new kitchen. Before you commit, go over the features and styles available so you find the stove that will meet all your needs. Most stoves come in various colors, so you should be able to find the cooker with the features you want in a color that will complement your design scheme. Basic neutral tones, such as black or white, will work in just about any kitchen. Consider sticking to these neutral tones if you`re a frequent remodeler, as neutral colors will fit into more design styles than more rare ones. If you think you want to keep your kitchen`s new design for a long time, you can go with a stove in a more unusual color, such as red, black or stainless steel. While stainless steel appliances are common now, the silver may not be in certain design schemes. The basic energy type you`ll have to pick between is gas and electric. Both have their own pros and cons. If you have pre-existing hookups, you may want to stick to the type of stove your kitchen has the connections for. Budget-wise, which type will cost you less to run depends on the cost of electricity and gas in your area. Gas cookers offer more control over the heat, especially in the oven, than electric cookers do. However, electric stoves are often easier to clean and cost less than gas stoves. 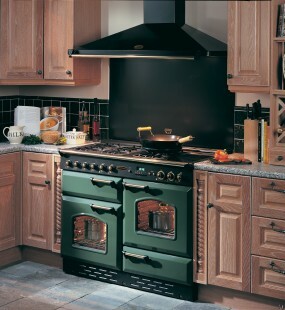 Once you`ve decided the energy type for your new cooker, you`ll need to choose a design. The three most common designs are the slide-in range, which fits between two cabinets but doesn`t have finished sides, the freestanding range, which has finished sides and the drop-in range, which is built right into your cabinets. Your design choice must fit into your kitchen`s layout and design scheme. The cooker should not take up too much space or be difficult to get around after installation. Measure your stove space multiple times so you know how much room you have to play with and don`t end up with a cooker that won`t fit into your kitchen. Ovens come in conventional, convection and combinations of both as far as the internal heating structure goes. Conventional ovens use the heat generated by the energy source and natural airflow to heat foods, while electric convection ovens use a fan system to heat food more quickly. Combination ovens use elements of both heating types and do cook food faster than conventional ovens. Consider your particular cooking needs when you`re deciding on a heating element type. Convection ovens do heat quickly and many users experience a lot of trial and error when it comes to determining the proper cooking time. If you`re not cooking for a lot of people or are often distracted while you`re making dinner, a conventional oven may be a better choice for you. If you`re planning on larger cooking sessions on occasion, consider a combination oven. Depending on your particular cooking needs and your kitchen`s design, a wall oven might be an option. You can pair the wall oven with a cooktop instead of choosing a more traditional cooker. Wall ovens and cooktops take up less space, so if you`re concerned about room, look into both of these options. Cooktops can be built into countertops or kitchen islands, giving you functional cooking and prepping space. Research features and prices, such as timers, before you make your final choice. Many stove models, such as the Rangemaster Classic Deluxe, come with electronic baking features for the oven.